What if you could reboot your health, tap into your creative self, reclaim your wild nature, lead from your heart--and still feel well rested? As modern women, we're taught that we can do it all, have it all, and be it all. While this freedom is beautiful, it's also exhausting. Being a "worn-out woman" is now so common that we think feeling tired all the time is normal. According to Karen Brody, feeling this exhausted is not normal--and it's holding us back. 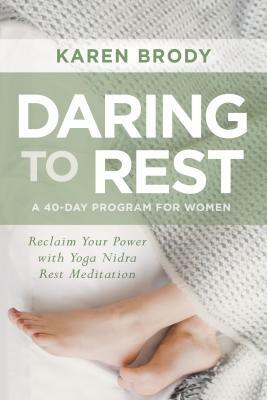 In Daring to Rest, Brody comes to the rescue with a 40-day program to help you reclaim rest and access your most powerful, authentic self through yoga nidra, a meditative practice that guides you into one of the deepest states of relaxation imaginable. Though it comes from the yogic tradition, yoga nidra doesn't look like a typical yoga class--the entire practice is done lying down. As you listen to a guided meditation, you're gently taken into complete inner stillness, effortlessly releasing into a healing state that works on both cellular and subtle body levels. With Daring to Rest, Brody presents a comprehensive yoga nidra program that unfolds in three phases: rest for physical exhaustion, release for mental and emotional exhaustion, and rise for tuning in to the "life purpose exhaustion" that can come when we're not in our full power. Each phase includes a downloadable yoga nidra guided meditation and supportive practices. "By directly accessing your subconscious mind, yoga nidra helps shift the long-held patterns that prevent you from stepping fully into your purpose and power," writes Brody. "Now is the time to break the cycle of fatigue and return to your truest self--the woman you are when you're not constantly exhausted." This is a book about yoga nidra, a meditation practice that helps with relaxation, sleep, rest, and healing. Karen BrodyKaren Brody is a women's well-being and leadership expert who helps women journey from worn out to well rested and then dream big in their work and lives. A certified yoga nidra instructor, she is the founder of Daring to Rest(TM), a yoga nidra-based self-empowerment program for women. She has an MA in Women and International Development from the Institute of Social Studies in the Netherlands, and a BA in sociology from Vassar. Karen is also a playwright, and Birth, her theater-for-social-change play has been seen in over 75 cities around the world. She is the mother of two boys and met her husband in the Peace Corps. She resides in Washington, DC, but considers the world her home.